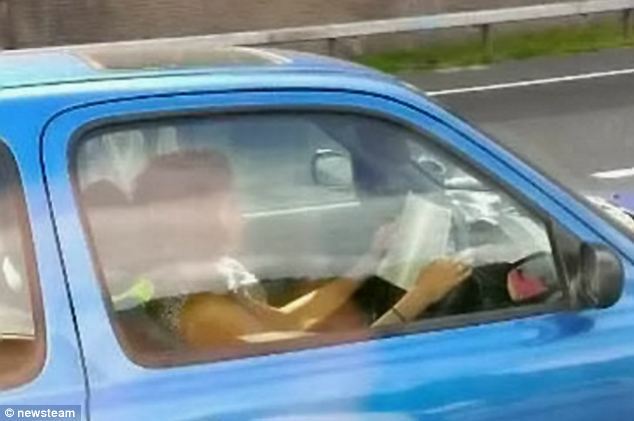 Risking lives on one of the busiest motorways in Britain, this woman was spotted casually reading a book at the wheel of her car - while driving at up to 70mph. 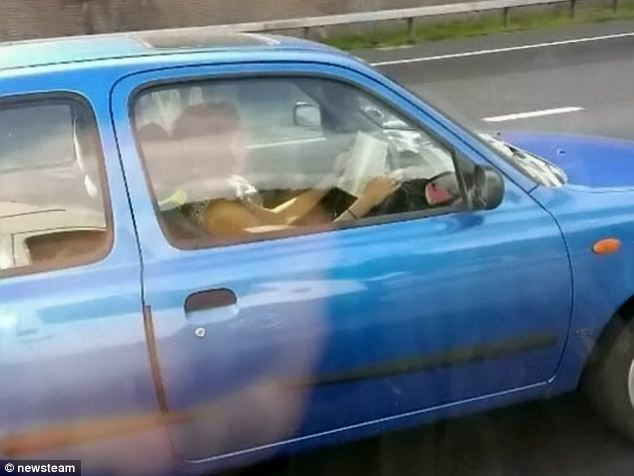 The driver was travelling alone along the M1 in Leicestershie with the book spread across her steering wheel - and even carried on turning pages when other motorists were frantically waving at her to stop. Road safety campaigners have called the pictures 'shocking' while police described the behaviour as 'irresponsible and dangerous'. 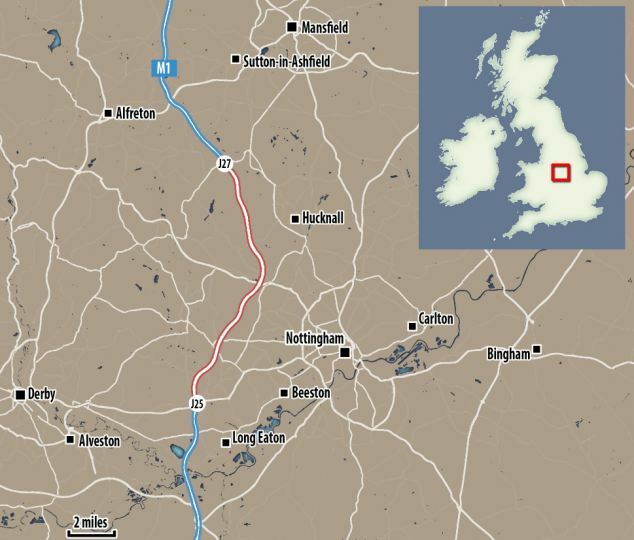 Builder Andrew Stonham was heading home on the M1 in Leicestershire when he spotted the reckless act. He first saw her at junction 25 - and continued alongside the blue Nissan Micra until junction 27 ten miles away. Mr Stonham, 28, who was the passenger in a workmate’s vehicle, said: 'We saw her about 200 yards back and my friend said he thought something was up. 'We caught up with her but we were struggling to keep up in the central lane. It’s not even like she was in the slow lane. Mr Stonham, from Kirkby, Nottinghamshire, took a mobile phone picture of the woman from the passenger seat of the vehicle he was in last Wednesday between 3.30pm and 4pm. The father-of-three noticed other drivers flashing their lights at her and witnessed her continuing to read until he and his colleague pulled off the motorway at Junction 27. 'We’re on the motorway all the time and we see people eating or putting on make-up, stuff like that, but this was unbelievable,' he added. 'I would like the police to try and attempt to track her down if possible, because she needs to be told that this behaviour is not acceptable and can result in death. 'The road was busy at the time and she could have quite have easily have ploughed into the back of somebody. I have no idea what she was thinking. James McLoughlin, spokesperson for road safety charity Brake, called the image 'shocking'. 'At Brake, we work with many families who have lost loved ones and had their lives torn apart because someone decided to multi-task at wheel. 'We're calling on government to increase fines and make traffic policing a national priority to deter risky, multi-tasking drivers. A Nottinghamshire Police spokesperson said: 'This behaviour is clearly irresponsible and dangerous and if witnessed by police we will act accordingly and seek to prosecute the driver.